halifax crafters: Holiday Handmade Market! 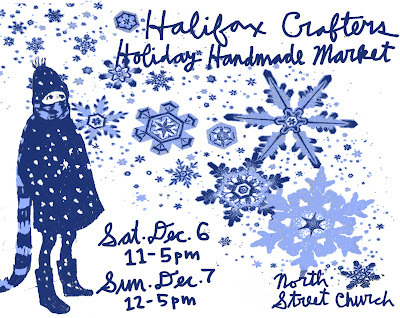 Halifax Crafters invites you to our Holiday Handmade Market! All made by hand with love and passion in the Maritimes. So enjoy the talent out here that has been working away on fantastic projects- these skilled people make things we can really get excited about buying, wearing, using and giving. Walk around and see what surprising thing someone has done and be inspired. Meet the person who makes the item and ask them questions. Know that all the vision and hard work came from a neighbor and feel an extra sense of pride in wearing or using something really stylish. Stumbled upon you folks this morning doing a search for 'jewelry made in the maritimes'. I'm going to link to your blog from mine if that's kosher. I'd like to dig up some more 'maritime' links so if you know of any please do pass them along! Good luck with your upcoming event.